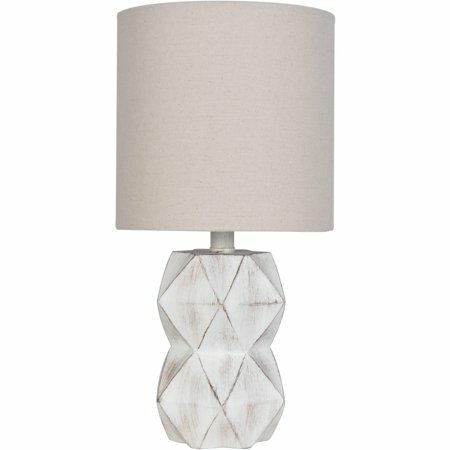 The Better Homes and Gardens White Washed Faceted Faux Wood Table Lamp is the perfect addition to your home or office. It is ideal for setting on an end table, dresser, or desk to illuminate the area you are working or relaxing in. Suitable for living room, bedroom, den, kitchen or office. To maximize the brightness the recommend bulb is 40 Watt Type A or 6 Watt LED, bulb not included. The Better Homes and Gardens White Washed Faceted Faux Wood Table Lamp has an easy on and off push through switch with a cord that makes it easy to set up near any standard outlet. It is UL-Listed for safety. It features a plastic distressed white faceted faux wood pattern base and an oak colored hardback shade. Add the Better Homes and Gardens White Washed Faceted Faux Wood Table Lamp to bring an extra dimension that complements a wide variety of decorative schemes with its antique look. Cute little wood lamp. Works great on my writing desk. Whitewash look, great for a coastal look. I woukd think it would be too small for a night stand (personal preference). But works great on a desk. Great little rustic modern lamp. Gives off great light. I use it in the entry way of my home. Perfect little lamp for small tables. I bought two for night stands in guest room and they are perfect for the space. GORGEOUS. Perfect in my bedroom on my night stands. Perfect size for my desk or night stand in my bedroom but will use for my desk as it matches my desk perfectly. Its an antique white and the detailing is a gold or light brown. The shade is not white - is more like a light khaki/ light sand color but still goes very well with the lamp. It appears very well made. It's small and very nice. I'm very glad I ordered. Was packaged very well for shipping...always appreciate this bc it displays appreciation for customers and our business. This would of been perfect if it was just about twice the size of the wood part for my bedside table. It was just too small and didn't look right. The shade fits so snug that it's hard to turn off and on etc. I love the look and it seems well constructed for the price! It's just so small. Total heighth is only about 20 in maybe. It's cute but not for living room. I chose the lamp because the design and size was attractive and fit well with what I needed for a bedside table lamp . In opening the package the lamp looked attractive and well-made when I added the bulb and plug the lamp in it did not work. I rechecked, used another bulbl, etc., but the lamp would still not work. Am in the process of returning it for a refund.